A slice of a raw 3D MR image (left) compared with simple Gaussian smoothing (center) and edge-preserving bilateral filtering (right). The bottom row shows pixel intensities for the red scanline of the slice. The Gaussian filter indiscriminately smooths the data, while the bilateral filter preserves important details in the image. Denoising is a important step in many image processing pipelines for brain magnetic resonance imaging (MRI). We have focused on two 3D filters, the bilateral filter and the anisotropic diffusion filter, that remove noise and smooth features within MR images while at the same time preserving edges in the image. Our implementations of these stencil-based algorithms are hand-tuned in NVIDIA's CUDA programming language to take advantage of the high computational throughput of GPU coacceleraters. 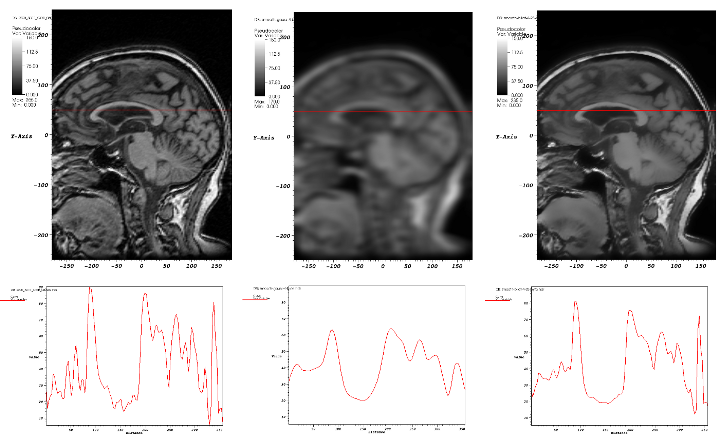 Using reference MR images from the BrainWeb Simulated Brain Database, we have performed automatic parameter sweeps for various parameters of the bilateral and anisotropic diffusion filters to identify optimal settings for reducing noise. We measured noise reduction by applying our filters to a BrainWeb image with artificial noise, then comparing the filtered image to a noiseless reference image to calculate a ``mean-squared error'' (MSE). Our analysis of MSE reduction for the bilateral and anisotropic diffusion filters suggest that it is easy to choose parameters that either oversmooth or, especially in the case of the bilateral filter, provide diminishing returns for the cost in runtime. In future work, we plan to assess the suitability of these denoising implementations and parameter choices for an image processing pipeline where we also perform segmentation and calculate validation scores. M. Howison. Comparing GPU Implementations of Bilateral and Anisotropic Diffusion Filters for 3D Biomedical Datasets. SIAM Conference on Imaging Science, April, 2010. Sample data for this work was provided by the UC Davis Alzheimer's Disease Center, which is supported by the National Institutes of Health under grant No. P30 AG010129.